Sixth Form student Rosie Muxlow has gained top marks in the service and maintenance of hydrocarbon systems. 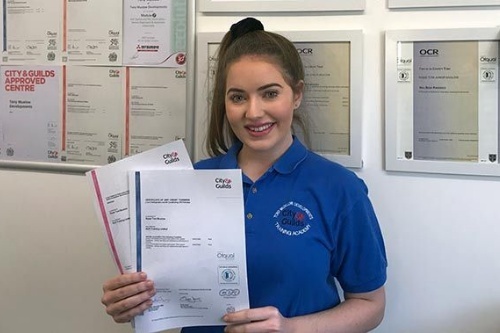 Rosie, who is the youngest person to become F-gas certified, was busy training in December for the City and Guilds 6187-21 level 2 Award in Hydrocarbon Refrigeration, Air Conditioning and Heat Pump Systems, Service and Maintenance. The assessment was held on December 19 and involved Rosie ensuring full compliance with health and safety as well as checking the refrigeration system was working correctly when completed. She was also assessed on her theoretical knowledge and was rewarded by gaining the highest result ever recorded at the City and Guilds assessment centre. In January 2016 Rosie became the youngest person ever to gain category 1 F-gas certification. She also holds the City and Guilds 7543-01 Mobile vehicle air conditioning certification and has qualified as an assessor. Rosie now regularly helps her father, Tony Muxlow, who runs the Newark-based refrigeration company, Tony Muxlow Developments, train other students.